Measuring employee engagement? Care needed! When leaders in organisations decide to measure employee engagement, they know that it’s a two-edged sword. There’s been some fevered discussion on LinkedIn in the past few weeks about KPMG’s decision to “stop” measuring employee engagement across its workforce. Some commentators have been almost vitriolic in their response. Not at KPMG, but at the poor … More Measuring employee engagement? Care needed! 3 Comments Measuring employee engagement? Care needed! Technology – blight or boon to your career? Leadership resilience – what’s it all about? 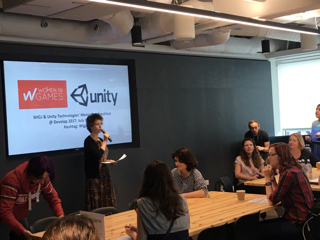 Such a buzz at our WIGJ/Unity Technologies' mentoring breakfast at Develop 2017! 30 fabulous mentors and 100+ enthusiastic mentees. So much talent all in one room! Interested in one of our services? To find out more, click the image above to request a free 30-minute consultation. Or email us on coachingtechnologyltd@gmail.com. Interested in receiving Leigh’s Musings Blog? Click on the Sign Up button to receive regular news & updates from Leigh about careers, leadership & technology. Enter your email address to follow Leigh's Musings blog and receive notifications of new posts by email. Then either click on the Consultation Request box on this page, or email us on coachingtechnologyltd@gmail.com.